Betel leaf itself contains antiseftik and phenol content in the antiseftif five times more effective than ordinary phenol. In addition, the content of betel leaves can treat various types of diseases that are beneficial for our health. Betel leaves often encountered in the woods or on the market, but we do not know the benefits of the betel leaf. Mash three ingredients until smooth and then rub it on the stomach with diarrhea. 7 betel leaves crushed and then mixed with 1 piece of rock sugar and rebuh into two cups of water until the remaining half. Decoction is then filtered and drunk 3 times a day with a drink is three tablespoons. Boil 6 betel leaves are still young into a glass of water. Results stew after cold then used to wash the eyes as much as 3 times in one day. 10 betel leaves boiled to within two and a half liters of clean water. After boiling and then let cool and use to clean vgina. Those are some ways efficacy of betel leaf and their role for kesehtan body is very beneficial for us to traditional natural medicine. May be useful for everything. 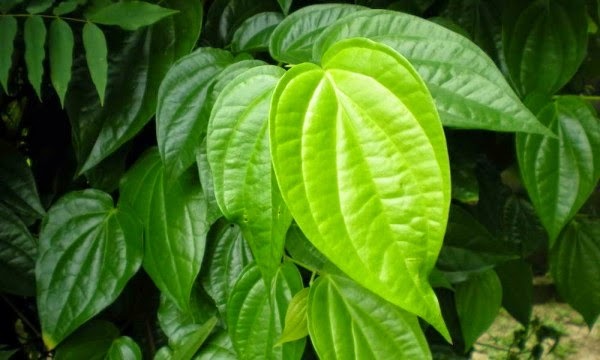 0 Response to "Betel Leaves Benefits For Body Health"